It was a hot Sunday that we sent Valenica, the chef-owner of Chilam Balam (3023 N Broadway, 773-296-6901), to the Logan Square farmers’ market—so hot that he couldn’t bear the thought of turning on an oven. 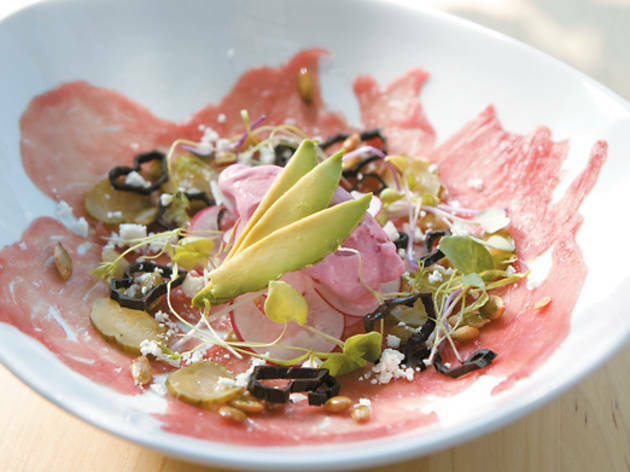 So he went the other route and created a dish that instead depends on the freezer: a cool goat carpaccio layered with multitextured garnishes and topped with a big scoop of savory ice cream. Find Mint Creek Farm goat at the Logan Square farmers’ market, Sundays, 10am–3pm at 3107 W Logan Blvd, through Oct 25. 1. Preheat oven to 400 degrees. Toss beets in a tablespoon of corn oil, season lightly with salt, and wrap in foil. Place on a baking sheet and bake for about 40 minutes, or until softened and peels slip off. Set aside to cool. 2. Meanwhile, heat a tablespoon of corn oil in a sauté pan over medium heat. Add onion and garlic and cook until softened. Remove from heat and chop finely. 3. Peel the beets and place in a blender with cooked onions, garlic and milk. Blend until thick and smooth. Set aside. 4. Wrap the bay leaf, oregano and thyme in a small bit of cheesecloth. In a sauce pan, bring the cream, herbs, agave syrup and a pinch of salt to a simmer. In a separate bowl, beat the eggs and egg yolk, then whisk in a spoonful of the hot cream mixture to warm it. Add the warmed eggs to the rest of the cream mixture. Mix in the beet puree. Chill the mixture in the refrigerator. Once chilled, spin in an ice-cream maker according to manufacturer’s suggestions. 5. Trim the goat loin of any fat and silver skin and cut into two-inch pieces. Wrap the pieces in parchment paper and place in freezer for about three hours, or until almost frozen solid. Cut paper-thin slices of the loin using an electric slicer or a thin, sharp knife. 6. Arrange goat slices on the bottom of a plate. Slice the breakfast radish, toss in corn oil and a pinch of salt, and mound in the middle of the plate. Top with pasilla rings, toasted pumpkinseeds, queso fresco and pickle. 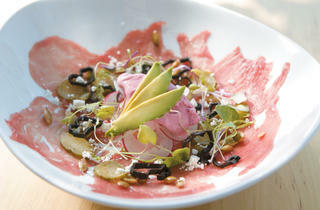 Place a scoop of the beet ice cream on the bed of radish and top with a few slices of avocado. • More "At the market with"